Every construction worker, carpenter, or handyperson needs an essential tool like a laser level in their toolkit. It’s one of those tools that we don’t appreciate enough before we actually get them. A laser level can significantly improve the quality of any construction task and save a lot of time, and with all those different models on the market, they can fulfill various job requirements. A construction worker will probably need a multi-purpose tool, but a handy person will search for a simpler laser level. You don’t need a multifunctional laser level to replace a window or hang pictures on a wall, right? 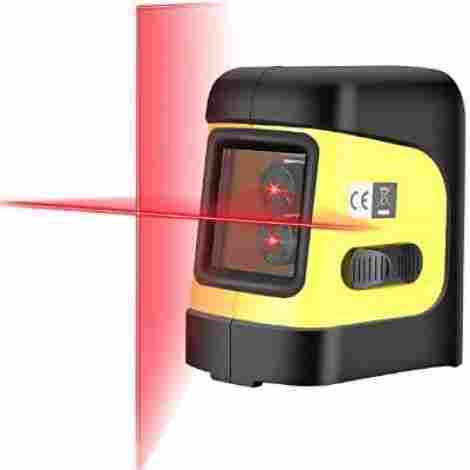 Laser levels are tools invented many years ago, and their purpose was primarily related to surveying and construction. These tools have a laser beam projector fixed to a tripod. They project a red or green beam, indicating a straight line. 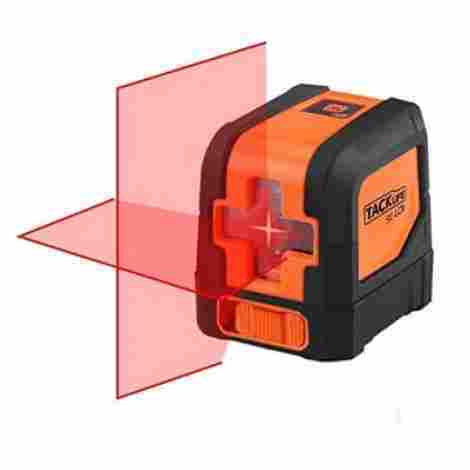 When a laser level has a rotating head with a mirror, the line is turned around in a vertical axis. With technological improvement, laser levels have rapidly evolved to smaller, simpler and more exact tools. In that way, they became easy to use on all kinds of surfaces, suitable both for big construction jobs and simple housework tasks. Additionally, they became affordable and therefore broadly used. Now we can choose a laser level that is proper for our specific job requirements. 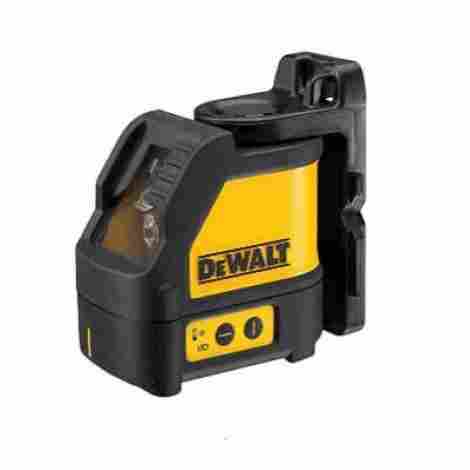 The best laser level on our list is made by the well-known manufacturer Dewalt. DW088K laser level is excellent for both indoor and outdoor leveling and layout applications, mainly because it has horizontal and vertical lines. Two-line levels provide great performance in various tasks. Professionals who are installing floor or wall tiles, or mapping wall layout, will be delighted by this product. Additionally, every handyperson will find Dewalt DW088K helpful in common chores around the house because of its advanced features. The DW088K is a self-leveling laser that provides more accurate measurement than manual leveling lasers. The only drawback is that you can’t disable the automatic leveling option. The laser will not project the line at a custom angle because you can't lock it manually. Although self-leveling provides a high degree of accuracy, some people prefer the option of manually changing the angle. The cross-line laser has an impressive beam range of 100 feet that can be extended up to 165 feet with a receiver. However, keep in mind that light can reduce the visibility of the laser level. If you use it indoors, you’ll probably have the perfect 100 ft of range, but if you take it outside the lines will be less visible. Therefore you should have in mind that DW088K is not so great for construction projects. You can achieve 50 ft of range in outdoor conditions, but the line will not be visible further than that. However, adding a receiver would increase the range significantly. Because of its magnetic pivoting base, this laser level allows simple positioning and angling the line level. It’s lightweight (3,6 lbs) and easy to move. Being IP 54 rated for water and debris resistance, DW088K is also very durable. The package comes with an additional box so you can transfer and store your laser level properly. It’s great when the product itself is firm and solid, but having an additional box where you can store it is even better. Not to forget that DW088K has a full-time pulse which can be used with a detector. How great is that? This product is one of the best among its type, and it’s also a bargain. You probably won’t find a better price for similar high-quality specs. The DW088K's popularity says it all! Nevertheless, if you still doubt that this is the right choice for you, there is a 3-year limited warranty that may ease your mind. Bosch GLL 55 laser level provides horizontal, vertical and cross line modes. The possibility of projecting two lines together or separately, depending on what you need, makes this laser level suitable for various alignments and level applications. It’s designed with VisiMax technology that provides higher brightness of the red beam but also protects the laser level from overheating. In this way, the diodes maintain secure temperature while producing the best line visibility. Overall, it’s a high quality and durable product with various applications. 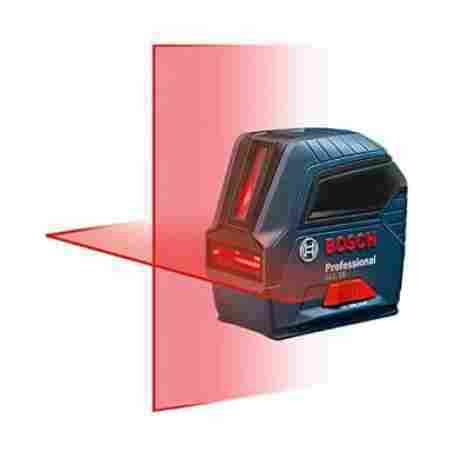 The Bosch GLL 55 is a red beam laser of two self-leveling lines. Line range is 50 ft with an accuracy of 1/8'' at 33 ft. Although this range is great for indoor tasks, it’s not well adjusted for outdoor use. The red beam is also too bright to be visible in daylight. Outdoors it can produce a 15 ft range of visibility, which is not so much compared to laser levels that have a receiver or a sensor. You can use red laser recognition glasses or a red laser card to extend the range, but this tool doesn’t have a pulse mode and can’t work with detectors. Also, it’s accuracy and range will depend on weather conditions. Nevertheless, we can’t overlook its great performance with indoor applications. For every handy person or a small contractor, this is an outstanding tool. DW088K laser level has a high degree of accuracy in close range, so it's great for ceiling work, cabinetry installations and interior framework. Bosch GLL 55 has a simple user interface with three key buttons. It’s a simple tool that's easy to use. The two laser lines are controlled by push-buttons on the back of the laser's case. GLL 55 also has a pendulum lock mechanism that is turned on or off with a simple slide of the button. The self-leveling begins when you slide the on button. Slide it again to off, and the pendulum will lock. When you don’t lock it the self-leveling is automatic. This is a useful mechanism for creating lines at custom angles. GLL 55 has a strong and durable case, and its water and dust resistant (IP 54). Not only that you can safely transport the laser level in a sturdy case, but you'll protect it from severe weather conditions. Last, but not least, the easy installation of the tool is also important. If you asked yourself how to install the laser level if you don’t have a tripod, we have the answer! It has a magnetic bottom which provides quick and easy setup on any metal surface. Boch GLL 55 is an inexpensive tool that provides great value. We’ve already noticed that it’s more suitable for small contractors and handypersons, and the price is also within their reach. Its high-performance can compete with many expensive laser levels, definitely making it a good choice if you want an inexpensive and yet efficient tool. This is one of our favorite tools, although it’s not among the best laser levels on the market. Truth to be told, everybody needs a small and practical tool like this. You’ll probably find yourself using it where you thought you don’t need leveling at all! The best thing about it is that this laser level is lightweight and therefore easy to use and suitable for various applications. The enormous popularity of this tool also demonstrates its great performance. Qooltek is a great tool for almost any housework. Why would you use a big and expensive laser level for simple tasks such as painting the walls or framing? Qooltek can provide accurate measurements while being lightweight and easy to mount. However, if you need a laser level for commercial works, Qooltek isn't the right choice. It can be a great addition to other laser levels, but alone its features are not good enough. When we said that Qooltek is easy to use, we meant it. It has only one button which turns the laser on and off. Beside a laser, Qooltek has a traditional bubble level and measuring tape. With three bubble levels, you can measure vertical, horizontal and diagonal lines. The tape is 8 ft long and it has a lock mechanism that holds the tape on its place for accurate measurement. Qooltek is made of hard plastic material that can endure many falls or pressures. Despite its sturdiness, it is very lightweight (184g). You’ll find that it’s very practical and efficient at the same time. Qooltek is maybe the cheapest laser level on the market. It doesn’t have the high-level of features like larger laser levels, but it provides excellent quality. It’s a smaller tool so we can’t expect it to have the same performance as Dewalt or Boch, but if you don't need a large device for commercial projects, Qooltek may just be the right choice for you. 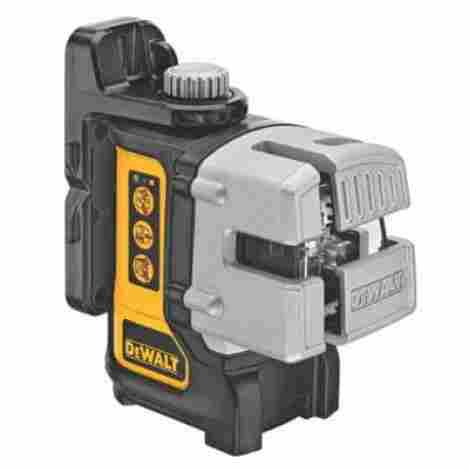 We have another Dewalt’s laser level on the list, and it’s DW089K. This model is an excellent option for professionals that need accurate and multifunctional laser level. DW089K has a range of 50 feet with an accuracy of 1/8 inches at 30 feet. Like it’s brother DW088K, this model has a detector and a receiver that can extend its range to 165 ft. When contractors have a big project that includes measuring both floor and ceiling, they often use two laser levels because one 2 beam laser can’t cover all. That’s why DW089K is very useful with its 3 beams. It allows easier application without an additional, second laser level. A third beam creates a 90-degree angle on the floor and the ceiling, so it’s useful for wall layouts and maps. Its diodes make brighter lines that are more visible in daytime conditions. This increases the visibility in long distances, but direct sunlight can still be an issue. The laser comes with a box which provides more protection during transportation, and with a vertically adjustable base. DW089K also has a micro adjust knob which allows for more accurate adjustment of the lines. You can easily adjust the lines to set on a specific mark. Also, the level laser has three different buttons that control three beams so you can control all the lines to align exactly to the shape you need. The only odd thing is that DW089K doesn't have a pendulum lock. Almost every laser level of this type and quality has a locking mechanism. Without it, it’s hard to guarantee for its durability. Although it has high-quality features and it’s designed for commercial use DW089K is a pricey product. This drawback is even higher when we consider that the model doesn’t include pendulum lock. However, most people find it useful disregarding the price. It just has so many good features! This Hammerhead’s self-leveling laser is a small, compact tool for everyday use. You’ll find it useful in various tasks and projects, especially because of its portable features. Whether you are hanging pictures on the wall or painting it, you’ll need a compact tool that makes the whole process easier and more accurate. This model is a self-leveling laser level, which means that you don’t need to search for the best angle by yourself. The self-leveling range is within 4 degrees. It has the indicator that turns red if the laser level is out of the range. How cool is that? The horizontal line of this laser level is movable within a range of 110 degrees. This can be very useful for working on multiple walls. The laser level projects horizontal, vertical or cross lines with an accuracy rating of ¼ inches at 30 feet. This is not the best rating, but it’s enough for most household tasks. Here we have a common problem with the red beam: it’s not visible enough when you take it outside. The good thing is that Hammerhead has a clamp so it can be easily moved closer to the project that needs laser lines. The adjustable clamp allows you to attach it almost everywhere. The drawback is that this laser level doesn’t have a locking mechanism that would protect it during transportation or other risky situations. You’ll need to be extra careful. Hammerhead laser level is a low-cost tool which provides quality features. It can give the performance of many better-equipped laser levels, and it costs much less! How's that for a bargain? Firecore F112R has a 1/8 inches accuracy at 30 ft, which is pretty good for a smaller laser level. It has a self-leveling option and an indicator that turns green if it’s out of range. It projects horizontal, vertical and cross line, making it suitable for odd corners and angles. The lines can be produced both simultaneously and separately. With one-button operation mode, it’s pretty easy to use Firecore F112R. You just need to push the button several times according to option you want it to perform. Not to mention that this laser level has a pendulum lock system that protects it from damage and provides durability. Firecore also has a magnetic base that allows easy mounting on any metallic surface. It can also be placed on a tripod. This compact laser level has a fabulous price. If you want a multifunctional tool for simple tasks, Firecore allows you to have it without spending a ton of cash. The only drawback is that this product comes without batteries in the box. You’ll need to purchase them separately. Tacklife SC-L01-50 laser level is primarily an indoor tool. It works great with smaller installations and applications such as tile alignment, installation of windows, doors and many others. If you’re a handyperson that wants to do it all by yourself, this laser level will help you achieve it! Tacklife laser level produces a line of 50 ft, but the best accuracy is achieved at around 30 ft. Its accuracy goes to 1/9’’ at 30 ft which is more than good for an indoor, simple laser level. It has horizontal, vertical and cross lines that are highly visible. The SC-L01-50 laser level has a smart pendulum system that locks when it’s turned off and starts the beam when it’s on. The laser’s self-leveling range is within 4 degrees, and it works with the indicator. The indicator alerts you if the laser level is out of the self-leveling mode. SC-l01-50 is a compact easy-to-use laser level. It has a magnetic bracket that provides solid placement of the tool on any metal surface. It can also be mounted to a tripod for better adjustment. However, Tacklife lacks some of the additional mounting options that can make your life easier. It's worth to mention that this laser level is resistant to water and dust, and therefore really durable. The smart pendulum system also contributes to its long-term functionality. Once again we have a highly affordable and functional laser level. Tacklife is a durable and accurate, well-priced tool. The best thing about it is that you can get a great product at a cheap price and still get a warranty! Johnson Level 40-0921 is a powerful tool that will make your job easier. 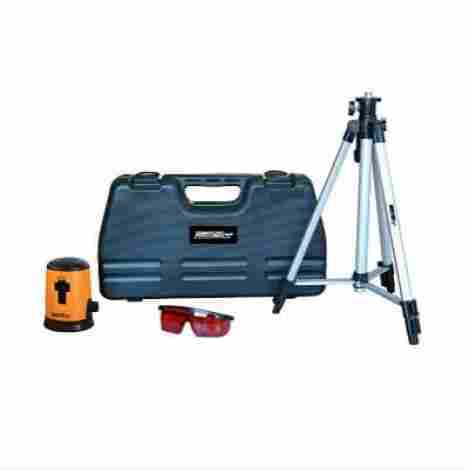 The whole kit includes a tripod, tinted glasses and a hard case for protection of the level laser. These additional tools contribute to the great value of Johnson's laser level. Johnson Level 40-0921 can project the beam up to 100 ft. The range may differ because of the lighting conditions, but that’s a thing with almost every laser level. Also, it projects cross line beams, both horizontal and vertical simultaneously. It has a rotational base (360 degrees) that allows operation from many angles. You can just turn the base manually to adjust it at the preferred angle. This laser level has many great features such as a locking mechanism for better protection and an out-of-range indicator for self-leveling. The chances for damage are very slim, mainly because of the protection on the inner pendulum. With higher protection rises the problem of portability. It’s not a large laser level, but take note that it’s not pocket size like two previously reviewed products. Johnson Laser Level is a high-quality product that provides great value for money. It’s not just that you’ll get a great laser level, but you’ll get the whole kit! However, please note that this laser level is not adequate for every application. Even if the lines have a higher degree of accuracy, this laser level is just not suitable for construction works. 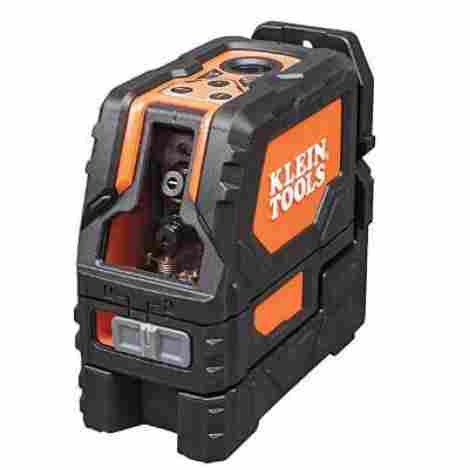 The laser level by Klein Tools is a great tool for professionals who need both beam lines and plumb spots. With its many mounting options and protection measures, it’s made to endure heavy conditions and last a long time. Even though it lacks some features, you’ll find that this laser level is a great choice! This laser level has an accuracy of 3/32″ at 33 feet. The self-leveling works within about 5 degrees and it has an indicator to alert you if it’s out of range. Another useful feature is its plumb function. It’s great when you need to put something in the center of the room. The laser level will mark the point on the ceiling or the floor where you need to center your objects. Although it performs good, it could be a bit brighter. It’s less noticeable than other compared products. It has an IP 54 rating which means it’s water and dust resistant. The pendulum locks, which is also great protection, along with rubber coating around the vulnerable areas. Additionally, Klein laser level comes in a box made from hard, durable plastic material. You can mount Klein laser easily in various places. It has a magnetic bracket with a rotational option (360 degrees). This is an excellent option for any wall or ceiling installation. It can also be placed on a tripod or to a mounting clamp with the metal surface. Klein laser level is well-priced for various features it provides. It’s not the cheapest product on the market, but it’s in range of the most high-performing laser levels. 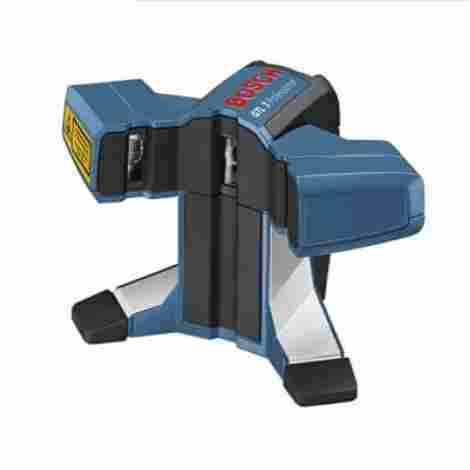 The Bosch tile laser is a small tool suitable for various applications. It’s easy to install and simple to use, so it’s perfect for smaller projects such as tiling and flooring of the bathroom or kitchen. If you need something that will work for commercial projects, you should skip this product. Bosch GTL3 can project lines of 90 degrees for squaring. The accuracy goes up to 1/16 at 20 ft (1/8’’ at 20’ between 45 and 90 degrees). Both lines are in front of the box of the laser level. This design provides easy centering and accurate adjustment. The beam lifted from the surface can go over bumpy surfaces which is very useful. It has a range of 65 feet, but you should be aware that the beam becomes a bit blurry in the distance. Nevertheless, it’s pretty accurate and bright for a tile laser level. Bosch has a magnetic base that allows it to be attached to the metal plate which comes with the laser. This plate can be set on the wall so the laser can project a beam for wall tiles. However, the laser doesn’t have a self-leveling option, so you’ll need to use another tool for full precision. This laser level provides high-grade features for tiling and flooring, and it’s also well-priced. Although the lines don’t have enough range for large-scale projects, they are quite accurate in smaller spaces. After all, it’s affordable and in reach of almost any smaller contractor. There are various features and options that we had in mind when we researched the market and rated our 10 best picks. Our criteria set out below can also help you choose the features that your future laser level needs to have. The most important feature of every laser level is its accuracy. Whether you want to use it indoors or outdoors, you want your lines to be accurate and visible. There are types of laser levels that offer better accuracy in closer range, and there are the ones suitable for commercial works which can extend the range with a receiver. We tried to pick the best products from both groups. Even if we don’t expect an extended range from a simpler laser level, it’s still important that it has bright and sharp lines. For laser levels with a higher range of accuracy, the visibility of the beam under bright lighting conditions is a big advantage. We had in mind all these different requirements while making our 10 best laser levels list. When laser levels have a magnetic base, they can be easily placed on any metal surface. Many of our reviewed products have that option. The additional feature is a mounting champ, which is a great simple thing for moving the laser level all around the place. For better mounting of a laser level, you can always get a tripod. It’s a useful item, but not always necessary. Therefore we picked out some smaller, compact laser levels for our list as well. They can be placed almost everywhere, including the DIY tripod you made yourself. It’ very important that the laser level is durable and stable. Some of them come safe and sound in a sturdy case, but some are not protected that well. We also took into account the additional protection features, like possession of a locking mechanism. The smart pendulum lock is an essential feature, and laser levels which don’t have it are more prone to damage. Some tools have additional cases that come with the product for easy transportation, and they are rated higher on our list. In the end, we looked at every feature separately and then merged them together to determine the overall quality of the laser level. Every laser level has some drawbacks and choosing the best one will probably be a thing of preference. Nevertheless, the overall performance of a laser level is important even if you don’t need many different features. Cost and value were crucial to our research and rating of the laser levels. Although laser levels are generally affordable these days, there are always more and less expensive products. If you need a smaller tool for everyday usage, it’s understandable that you don’t want it to cost a fortune! Truth to be told, even the constructors don’t want to get some expensive laser level that doesn’t work well. That’s why we tried to find both affordable and valuable products and rate them accordingly. Where are you going to use a laser level? First thing first: where do you plan to use your laser level? If you’re just a handyperson that needs to fix things up around the house, you’ll need different laser levels from constructors who work on large-scale projects. The same thing applies to smaller contractors. Determine the purpose of your device to be sure you won’t make the wrong choice. 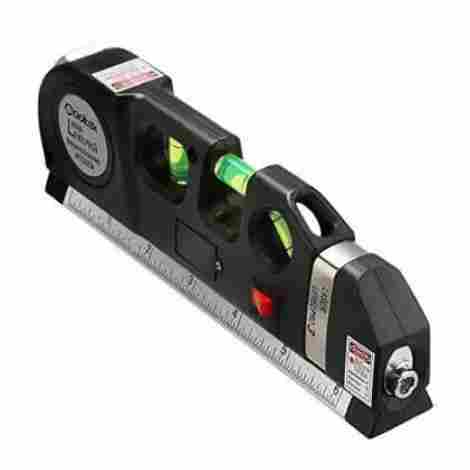 The basic form of a laser level is the line laser. It projects a line from where it’s placed. It’s great when you e.g. want to hang a picture on the wall. There are also dot lasers that project one or more dots if you need to center something. Rotary lasers project a line for every wall in the room so they can be used for many purposes. As we mentioned above, there are laser levels that project one or two beams. However, the projection itself can be different. Some laser levels have an option to project horizontal and vertical lines separately, while others can project them simultaneously as well. The other important thing you should consider about the beam is its color. They can emit red or green light. While red is most common these days, it’s a bit weak in the sunlight so it’s better for indoors. The green is more bright and can be used outdoors. Think about the place where you can put your laser level. If you need it in a worksite, you’ll probably want to get a tripod as well. For construction projects that are done outside, the portability of the laser level is very important, because you’ll probably move it around a lot. It’s a lot easier to use almost any model of laser level for housework. You can hang it, or place it on various surfaces. No matter if you are planning to transfer the laser level a lot, or to keep it in your home, you want to make sure that it can’t be damaged easily. 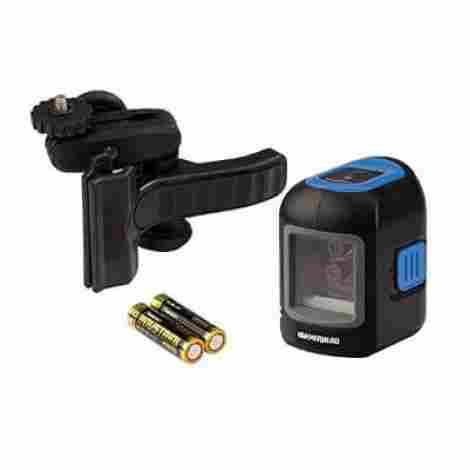 Laser levels that are in sturdy cases or have locking mechanisms are more durable. Some manufacturers also provide additional boxes where you can put your laser level during transportation. Look carefully at the quality of materials and features of every laser level you consider buying. Q: How to see a laser level in daylight? A: A laser level often works way better indoors than outdoors, because the sunlight can make the line almost invisible. A red beam is a bit weaker than a green beam if you use it outside. However, a green line can also be invisible on the grass. The visibility of a laser level will mostly depend on the conditions in which you work. You can also use a laser detector. It’s a device that helps with getting the measurements, but it can’t improve the visibility of the line. The better thing to use is laser enhancing glasses that help your eyes to filter colors of light so the lines of the laser level can be more visible. Q: Is the light from a laser level dangerous for the eyes? A: Laser light can hurt your eyes if you are directly exposed. However, the damage is usually not permanent. It’s more like a feeling you get from the camera flash, but you should avoid long staring at the beam. It’s better to be extra careful with the laser level, so always check whether the laser is adjusted correctly or not. Q: What does the IP rating on a laser level mean? A: The IP rating is a label for an international standard that is used to determine how good is the protection of laser level from dirt and water. It has two numbers: the first stands for dust and the second one for water. They show how good the protection is from 1 to 6 (or up to 8 for water). While dust resistance is commonly very high, only a few laser levels have high water resistance. Q: Does air turbulence have an effect on laser levels? A: The air turbulence is the main enemy of every laser level. The different temperature gradients between the laser and the target or the receiver cause an effect that is consistent with air turbulence. The higher temperatures especially affect the accuracy of a beam. The wind with different temperature can also cause some problems. While it’s easier to protect the beam from wind, an answer to higher temperatures can’t be found so easily. For example, two fans can be used to mix the air around the laser level, as they will reduce the air turbulence.